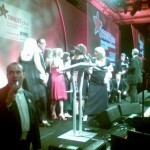 The National Graduate Recruitment Awards took place last night 21 May 2009 at the Grosvenor House, London. Alan Carr presided over the awards that seemed to go on and on and on with every possible sector of the job sector being represented. REC Technology sponsored the most popular IT & Telecoms graduate recruiter but it was not enough for Jeff Brooks, Chairman to present the award to Google, I think, or was it IBM? Most of the really big players seemed to pick up an award and Recruiterblog says good luck to them. Anyone having to spend so much time interviewing graduates with so few jobs in the current market deserves the recognition that the winners and nominees achieved yesterday.